I've been experimenting with trifluralin treatment of rhododendron seedlings for many years. I've mainly attempted polyploidization of seedlings from elepidote-azalea crosses and 2n X 4n azalea crosses. In the former case the purpose would be to induce allopolyploids to increase survival rate and vigor of seedlings with relatively high degree of genome incompatibility. In the latter case the goal would be to double likely poorly fertile triploid progeny to hexaploids of better fertility. As there is no easy diy way to determine chromosome number the success of my experiments remains to be tested in practise, when the hybrids reach flowering size. My recipe for the "yellow solution" is 0.08% trifluralin, 1% dimethylsulphoxide, 0.01% Tween-20 in water. 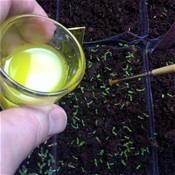 I put a small drop with the help of a brush or pipet between the cotyledons before the first true leaves are visible. I keep the seedlings in the same almost closed humid box that I use for germination during the treatment. I repeat the treatment once or twice with an interval of a few days. I have never observed considerable death of seedlings due to the treatment, but a temporary growth arrest is expected and suggests that the treatment is effective.